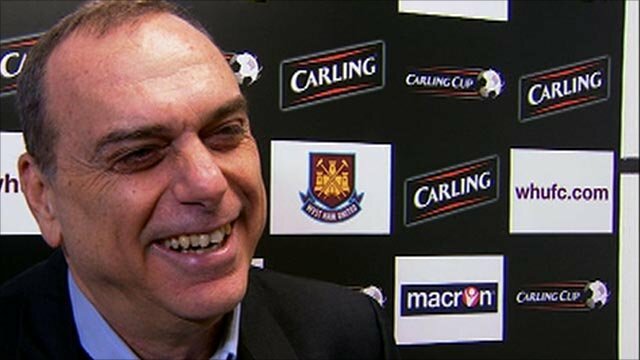 West Ham boss Avram Grant has been given a stay of execution as the club's manager, BBC Sport understands. Owners David Gold and David Sullivan refused to comment on Grant's future after a board meeting and the Israeli's side now faces Arsenal on Saturday. The 2-1 Carling Cup semi-final first-leg win over Birmingham and the FA Cup win over Barnsley last weekend has helped the immediate pressure on Grant. But he must guide West Ham out of the relegation zone to keep his job. 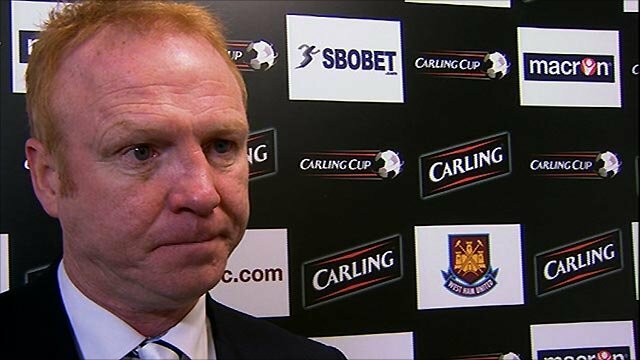 West Ham have suffered just one defeat in seven games and the Israeli said his future has been unfairly scrutinised. "We are one point from Wigan, Fulham and others but with them everything is quiet," said Grant. Four of those last seven games have been won and the 55-year-old added: "Unfortunately, we have to fight these rumours. I don't want to think about other things, I want to fight." After the win over Birmingham, which leaves the Hammers 90 minutes from their first trip to Wembley since the 1981 League Cup final, Grant was keen to deflect attention from his own situation and focus on the team instead. "Don't worry about me - I will be fine in any case," he said. "I really, really appreciate that you are worried about me and you like me and you want me to be near you! "I like you also, by the way. Why do you need to ask me about something that is not in my control?" Grant's Birmingham counterpart Alex McLeish was sympathetic to his plight. "It's not easy that, when you're reading about yourself in the papers and you have no control of it," he said. "I don't want to interfere in someone else's business but we know how football works, and we are all vulnerable when we get bad results." Midfielder Mark Noble says 10-man West Ham's battling display showed how much the players believed in their manager. "So much has been said over the last couple of of weeks and months, but you can see how the boys worked tonight," he said. "If they didn't like the manager I don't think you would have got that effort off them. That shows we're behind him and we're playing for the club and that's what we need to do." Despite West Ham's recent success in both the FA and Carling Cups, they were recently thumped 5-0 in the Premier League by Newcastle, leaving the London club a point adrift of safety. Grant's job may be safe for now after substitute Carlton Cole came on to score the goal that gave West Ham victory on the night and a precious advantage going into the second leg at St Andrew's on 26 January. There was a large element of fortune with the strike, which was tame but somehow squirmed through the clutches of Birmingham goalkeeper Ben Foster. Grant quipped: "It was a fantastic goal. Any goal is a goal but the attack leading up to the strike was great and then... no complaints." Birmingham manager Alex McLeish described the goal as "a little bit of a monstrosity". He said of England goalkeeper Foster: "He's a big man, he takes it on the chin, he doesn't hide and he apologised to the players. "He's saved us many times and he'll save us many times in the future." Noble gave West Ham the lead in the first half before the visitors equalised thanks to a Liam Ridgewell header. The Hammers were reduced to 10 men after Victor Obinna was shown a straight red card for kicking Sebastian Larsson, although Grant would not comment on the incident after stating he did not see it. However, he had high praise for his side, adding: "I feel good. We won with 10 players and the spirit was great. "We have recently played every three days with a small squad and you saw spirit. They didn't give up tonight and won the game because of the spirit. "We played very well in the first half. We could have scored more but the last ball was not so good. "In the second half, Birmingham scored from a corner, which is unusual for us. Then there was the red card but we did very well, despite the setback, and the substitution [Cole for Frederic Piquionne] changed the game." Meanwhile, McLeish thought that his side had a valid claim for a penalty when Matthew Upson appeared to push Barry Ferguson, with the score level at 1-1. "It's a stone-waller - I've seen it about five times," McLeish commented. "It wasn't just an impediment, it was a barge in the back. "If that's a shoulder charge then I don't know what I'm talking about."